The MP-1 is a bottle cage mount mini pump that compresses and pumps air on both stages of the pump stroke. The pump body is made from machined aluminum tubing with a second aluminum compression tube inside it to create the double action feature. At the air chuck end of the aluminum compression tubes is the double check valve assembly. The check valves each use a small steel spring to hold closed a machined aluminum valve that seats in a nylon enclosure using tiny O-rings to close tightly. The pump head is made of molded plastic and threads into the outer aluminum compression tube. The air chuck comes from the factory set to inflate Schraeder valved tubes but an inner rubber and plastic fitting can be reversed by un-screwing the air chuck face plate so Presta valved tubes can be inflated. The plunger assembly slides tightly into the pump's inner compression tube. The plunger shaft is made of Black aluminum tubing, while the compression piston is made of clear molded plastic. The piston uses two replaceable rubber O-rings and an oil lubricant to seal the piston in the compression tube. The plunger assembly pushes air into the inner compression tube, then a plastic plunger seal threads around the outer compression tube. 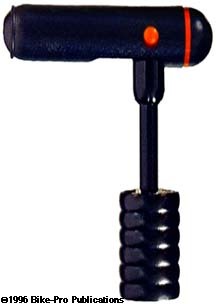 The MP-1 handle is made of molded plastic and is hinged so it can pivot and enclose a part of the plunger shaft leaving the pump with a clean looking "cigar" shape. The MP-2 is a double action frame pump that is nearly identical to the MP-1, but has a longer compression barrel and plunger shaft to compress a greater volume of air with each full stroke. The MP-2 uses the same reversible air chuck, double check valve, double aluminum compression tube, and a plunger shaft with the same pivoting handle. The aluminum tubes in the MP-1 are 6 1/4" long, while those used in the MP-2 are 12 1/8" long. The mounting clip is molded of Black plastic and because of the length of the MP-2 has a Velcro¨ strap to assist in holding the pump inside the clip. 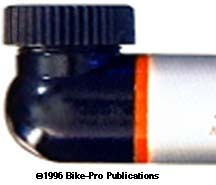 The clip, like MP-1 clip can be fastened in place of a bottle cage using bottle braze-ons or held in place using double sided tape and zip ties. The Blackburn MP-3 presents some refinement to the original MP-1 pump, which it is nearly identical to except for the air chuck assembly and the mounting clip. 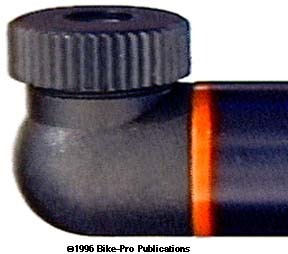 The air chuck on the MP-3 uses the reversible Schraeder/Presta parts but now has a thumblock that compresses an inner rubber fitting which constricts tightly around the tube's valve stem. Also under the threaded air chuck face plate is a ring that holds a cover which fits over the air chuck's valve stem opening to keep dirt and mud from clogging the opening. The mounting clip for the MP-3 removes the option of the double sided/zip tie fastening by permitting the use of bottle braze-on mounting only. The clip is made of molded nylon Black plastic and comes with 18mm long mounting bolts. The clip is bolted to the bike under the bottle cage so you can carry both the pump and water bottle. The clip holds the pump cantilevered off the side of the frame tube and has a Velcro¨ strap in addition to it's tight snap fit to hold the MP-3 firmly to the bike. It's plastic parts are Black with Red accents while the aluminum compression tube remains in a natural Silver. We found 1 full primary and secondary stroke displaced 49ml of air (49 centiliters). 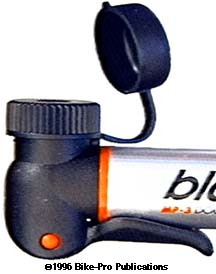 The Blackburn MP-4 is the last variation of bottle cage clip pumps from Blackburn. It use the same diameter outer compression tube of the other three MP pumps with no inner compression tube, making it a single action stroke pump. The Black colored aluminum compression tube is a slightly longer 6 7/8" which along with its increased inner diameter because there is no inner compression tube, compresses a greater volume of air with each full stroke. The air chuck has no thumblock but uses the reversible valve fittings of the other MP pumps. The air chuck has been modified slightly for use as a single action pump and the diameter of the piston is naturally slightly larger. The MP-4 uses replaceable rubber O-rings for all of its internal seals. Like the other MP pumps the plunger shaft is made of Black colored aluminum and the plastic handle pivots to enclose a section of the plunger shaft. The plunger seal, like the other models is made of molded Black plastic and threads around the handle side of the compression tube. The mounting clip is like the one used for the MP-1 giving the user an option of mounting the pump in favor of a water bottle or using double sided tape and zip ties to fasten it to the bike. The clip has a slot for a Velcro¨ strip to be used for additional hold but the Velcro¨ strip isn't included with the MP-4. It's plastic parts are Black with Red accents while the aluminum compression tube is anodized Black. We found 1 full stroke displaced 35ml of air (35 centiliters). It took us 250 strokes to bring a Dart HC to 40 PSI on a Mavic 231 rim, and 190 strokes to bring a 700 x 25c Continental SuperSport Ultra on a Mavic Open 4 CD up to 90 PSI. The MP-4 is 11 1/8" long, with the mounting clip it weighs 118 grams, the tape and zip ties can add up to 4.5 grams to this weight. Made in Taiwan. For those individuals that either already own, or are preparing to buy a Blackburn MP pump other than the MP-3 yet like the MP-3's mounting clip because you can carry both the pump and a bottle cage from the same braze-on set, Blackburn makes the MP-3 clip available separately. Called the SideClip Kit, it cantilevers the pump off the down tube, beneath the bottle cage and has a Velcro¨ strap at the middle as well as the two clips to rigidly hold the pump. The clip, again, is made of Black molded nylon plastic and comes with two nickel plated, longer 18mm mounting bolts with 3mm hex heads. Because all the Blackburn MP series pumps have the same outer dimension for their aluminum compression tube, this clip is compatible with them all. The clip weighs 17.5 grams and the two bolts weigh 6 grams. Made in Taiwan.